Carl Sagan has 2 media appearances. Carl Edward Sagan (November 9, 1934 – December 20, 1996) was an American astronomer, astrophysicist, author, and highly successful popularizer of astronomy, astrophysics and other natural sciences. He pioneered exobiology and promoted the Search for Extra-Terrestrial Intelligence (SETI). He is world-famous for writing popular science books and for co-writing and presenting the award-winning 1980 television series Cosmos: A Personal Voyage, which has been seen by more than 500 million people in over 60 countries. A book to accompany the program was also published. He also wrote the novel Contact, the basis for the 1997 film of the same name. 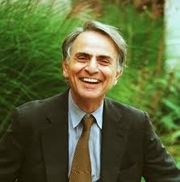 During his lifetime, Sagan published more than 600 scientific papers and popular articles and was author, co-author, or editor of more than 20 books. In his works, he frequently advocated skeptical inquiry, secular humanism, and the scientific method. Carl Sagan is currently considered a "single author." If one or more works are by a distinct, homonymous authors, go ahead and split the author. Carl Sagan is composed of 14 names. You can examine and separate out names.